Through the generous support of our donors, we are in partnership with the Omaha Fire Department and American Red Cross to provide and install combination smoke/carbon monoxide detectors free-of-charge to families in need to help keep them safer in the homes. On Saturday, February 21, 2015 we canvassed door-to-door to install the detectors to families in South Omaha who need them. 130 Families Sign-Up to Receive Free Detectors! Yesterday we were proud to participate in Omaha Police Department Southeast Precinct’s Christmas party at South High School. About 3,000 people showed up for Santa, fun, and treats, and a free toy was given to every child 10 years old and under! The toys were donated in large part thanks to a fundraiser organized by Eric Perez and Sonido travieso de omaha, and the entire event is organized by OPD’s Ofelia Robles. We were there to ask families to sign-up for our free carbon monoxide and smoke detector program to help keep them safe in their homes. 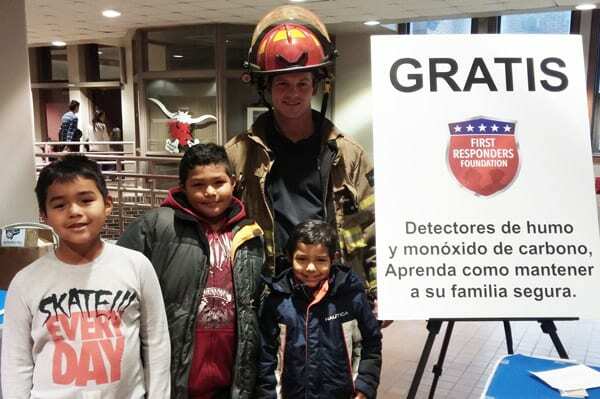 All in all, 130 families signed up to receive the detectors, installed by the Omaha Fire Department free of charge! Request your free detector by calling the OFD at 402.444.3560.